As attendees filed into the theater before the official proceedings began they were presented with a slide show of many of Joe’s numerous sketches from throughout the years, including sketches of Simba, Nala and Rafiki from The Lion King, and examples of his calligraphy (he began learning calligraphy in his fifties then used it almost all the time). When the official proceedings did begin they were ably hosted by film critic and Disney history buff Leonard Maltin, who always seemed to know the perfect thing to say in every situation throughout the evening. 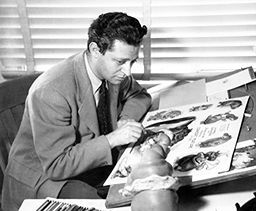 Clips such as the “Pink Elephants on Parade” segment from Dumbo and “Willie the Operatic Whale” from Make Mine Music were shown as well as the entire Mickey’s Gala Premiere short from 1933 for which Joe was responsible for animating the caricatured Hollywood celebrities of the day arriving in limos for a star-studded movie premiere. After showing some of these early Disney movie clips slides were presented of some of the beautiful ceramic work and greeting card designs that Joe worked on during his 40 year absence from the Disney company. Roy Disney was present and wearing a very brightly colored shirt featuring the flamingos from Joe’s Carnival of the Animals segment from Fantasia 2000. Eric Goldberg, who, with his wife Sue, was the primary animating force behind that segment quipped that he almost chose to wear that same shirt for the evening. Many of the panel members discussed how Joe was always leaving them little sketches and story ideas and Eric said he had his own “Joe drawer” and figured many of the other Disney people did too. Mike Gabriel, co-director of Pocahontas and Lorenzo, commented that if all these ideas from people’s “Joe drawers” were used that Disney could make 15-30 more good films out of them over the next 50 years. Pete Docter, director of Pixar’s Monsters Inc., also gave a little more insight into how Joe Grant came up with that title (it was a play on the title of an old mob movie, Murder, Inc.). Dean DeBlois, one of the co-directors of Lilo and Stitch, shared with the audience a special video he had made of a conversation he had with Joe in Joe’s office. This video segment shows Joe discussing his opinion of 3D animation (he was for it, and felt that Walt would be too, but also felt that traditional hand drawn animation would never completely die out) and showing many of his sketches from over the years to Dean. Joe garnered by far the biggest laugh from the audience of the evening when he showed Dean a frazzled caricature of himself and said that he drew it after seeing a particular movie from just a few years ago. If you want to know what movie he was talking about you will have to wait until this interview appears on the upcoming Lilo and Stitch 2-disc Special Edition DVD. A pristine digital print of Joe’s Oscar-nominated, Annie Award-winning short Lorenzo and the “Baby Mine” clip from Dumbo served as a one-two punch at the end of this life celebration. The idea for Lorenzo had been “marinating” in Joe’s head for several decades and was finally animated and released in the 2004. Don Hahn then presented the actual Annie Award trophy for Lorenzo to Joe’s family members who were present. As the evening ended and attendees got up from their seats and filed out of the theater a comically stern self-portrait of Joe captioned, “Get to work,” appeared on the big screen on the stage. I took it as an admonishment to myself. Special thanks to Larry Loc for the photographs.